When I don't take time to enjoy God, I lose my ability to enjoy people too. When I think that I can minister to people without first allowing God to minister to me, I dry up fast. I was kind of a negative example of this while in Albuquerque. I basically thought “I’m only going to be here for 3 days so I need to be with people as much as I can while I’m here. I can catch up with God when I get home.” So I neglected enjoying God. Consequently, by Saturday I was really drained. Both spiritually and physically (I actually came down with a minor cold as soon as I got home) but more spiritually. I know I’m getting drained spiritually when I see opportunities to minister in front of me (someone says or does something that would give a perfect opening) and yet I don’t know what to do. Sunday morning I finally took time to be with God for a while (and nurse my sore throat) and was trying to prepare for ministering in the jail in a few hours. I sensed God was telling me, “I’ve wanted to refresh you these past couple days, but you were too busy.” How humbling. Thankfully God is merciful and forgiving and He did give Dad and me a fresh filling of joy for the jail that morning. God wants to bless you with joy in His presence (Psalm 16:11). Let Him. This morning our friend Steve Howell went to be with Jesus. A big man with a scary beard and a big heart, Steve and his wife Cyndi are the founders of The Olive Branch, a local home for adults with developmental disabilities. He will be missed. In both a young girl and an old man, I saw a dimension of childhood that I wish I could recapture in my own life. I met both of them last week in Albuquerque. This 11 year old girl kept Lu and me utterly delighted for... was it an hour and a half? We lost track of time. She was oblivious to the effect she had on us. What was it about her? It was some amazing combination of an adult's intelligence and communication ability with a child's wonder in life. 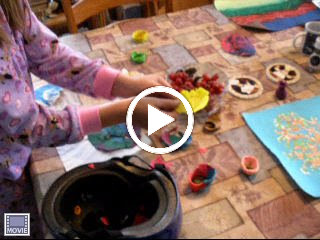 Click below to watch a video of her describing some of her art creations. The art isn't exceptional but the articulation is. 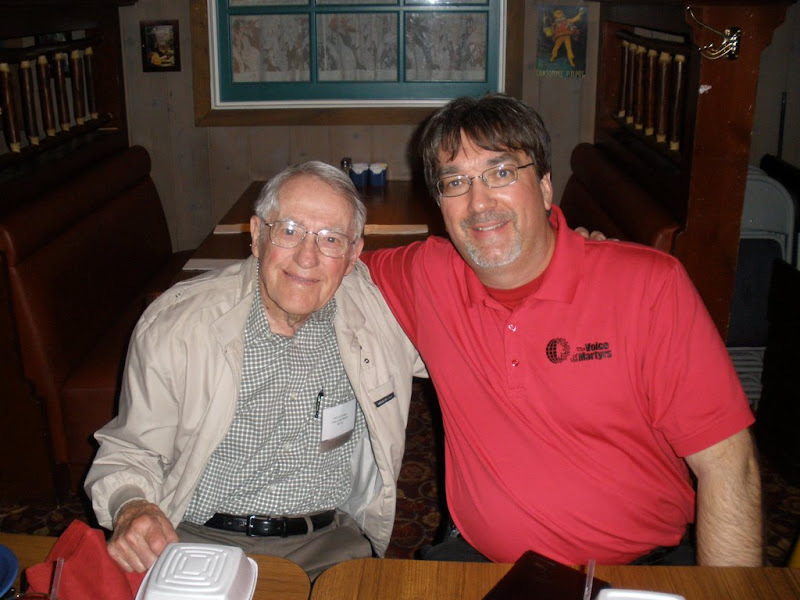 The 92 year old man is one of VOM's new reps in New Mexico, Bill Fry. Here he is at our team dinner Friday night. Bill has an infectious "wonder" about God's grace. When you hear him talk about Jesus, the Bible, or the persecuted church, you have the sense that he only learned about them in the last couple days and hasn't gotten "bored" with them yet. I don't know if he's always been like this or if it's just in the last few years that God has done this "work of childishness" in Bill. But in any case, if I make it to 92, I hope I have the joy and delight in God that he has. Providence: (noun) divine guidance or care. 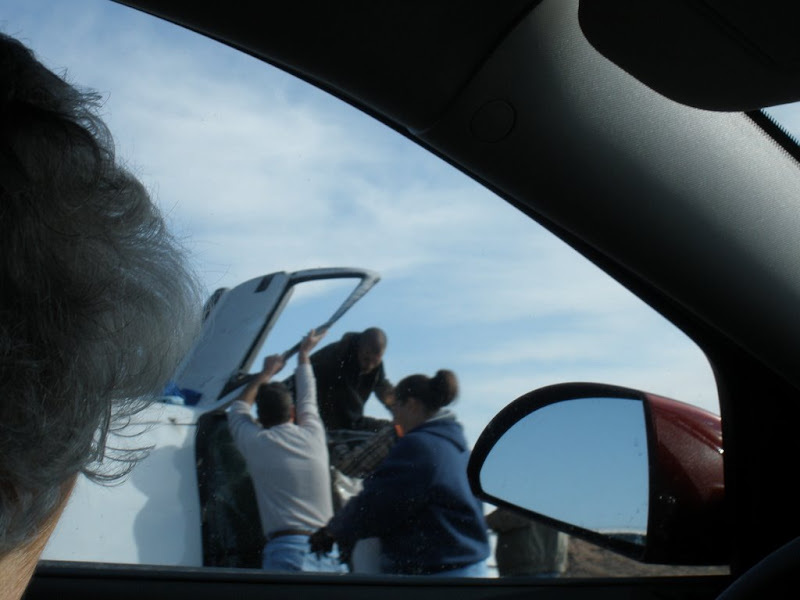 On last week's trip to Albuquerque, I saw God's providence worked out in many details. We planned to travel on Thursday morning. 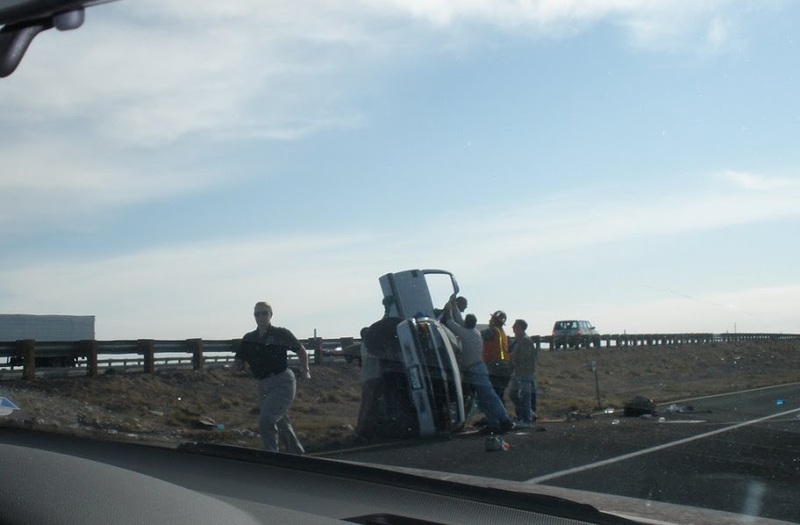 On Wednesday dust from high winds in Arizona closed a stretch of I-40 on which we would be travelling. The storm also brought cold temperatures and snow flurries. But Thursday's weather, although still cold, was calm and dry. (See picture below.) I-40 was open. Providence. 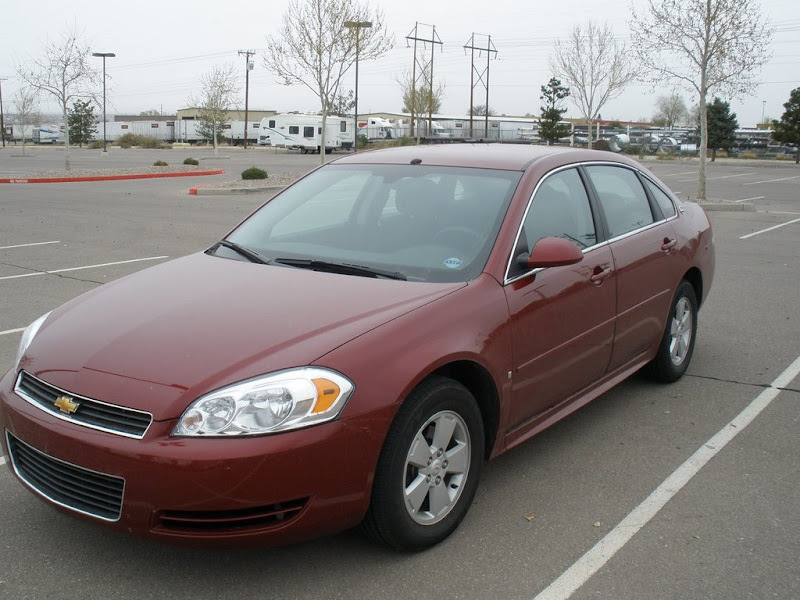 I traveled with Lu, a perky septuagenarian VOM rep in her perky 2009 Impala (very smooth ride and great mileage, in case you're looking). Lu kept me glued to my seat as we left Flagstaff, with an amazing story. She and her husband took a homeless man into their home six months ago. The man turned out to have a hair trigger temper, which came to a climax just a few days ago. She and her husband returned home one evening to find a note from their "renter" on their door which said there would be "hell to pay" if they entered their home. Incredibly, they quietly sneaked into their home and went to bed. The next morning Lu called the police, and after a semi-complex but efficient legal "due process", the police removed the man from their house. They were shown genuine care by the officials (and some of the officials go to her church!). What a blessing to live in a country where there is still some law and order, and no bribes were required for justice! Providence. Soon after Lu finished telling me this story, we witnessed an incredibly terrible automobile crash about 500 feet ahead of us, at exit 269 on eastbound I-40. A car in the left lane suddenly began flipping end over end to the right across the interstate, down the hill, and landed on the edge of the exit ramp. It was like watching a movie stunt car -- the worst accident I have ever witnessed. A tow truck and a red sports car pulled over immediately and their drivers jumped out and ran to the smoking car. I tend to be scared of getting involved in trauma scenes like this and I admire people who do jump into them. And in some third world countries, people stop when there is an accident, but they stop so they can steal the contents of the vehicles! I am thankful and blessed to live in a place where Good Samaritans roam the highways. Providence. I dialed 911. It rang for a long time before anyone answered. That was disconcerting. I was thankful I wasn't calling to report a man pointing a gun at me! When someone did answer I had to repeat the story a couple times as the operator transferred me from one person to another and finally the phone just went dead. However, about that time, a police vehicle pulled up. I really don't think there was time for him to have gotten word from the 911 operators, so he must have just been in the area and seen the accident. Providence. We drove forward to get a better look and amazingly, an occupant was crawling up out of the car as the Good Sams held the door open for him. He was bleeding from his scalp, but not profusely. I am amazed anyone could live through an accident like this, much less crawl out. We arrived at our destination in Albuquerque about 1:30 PM local time. In my next posts, I will tell you some more of the lessons I learned there, but I want to finish up this post with another example of providence. As I told you, on Thursday, we had great weather. On Friday, Albuquerque was cold (40s), cloudy, and wet (snowing in the mountains nearby). 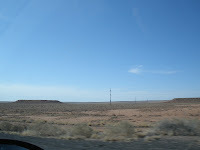 However, on Saturday, the day of our return to Arizona, the weather was dry, clear, and beautiful. "Thanks, Father, for caring so much for me, for Lu and her husband, for the driver of the wrecked car... and for giving Your Son to take the punishment we deserve so that by turning from our sins and trusting Him we can be forgiven and reconciled to You. That is the greatest demonstration of providence." Thanks to your prayers and God's goodness, I arrived home on Saturday evening from my 61-hour sprint to Albuquerque. It was a good trip and I learned some valuable lessons. I'll be sharing them with you over the next several days. 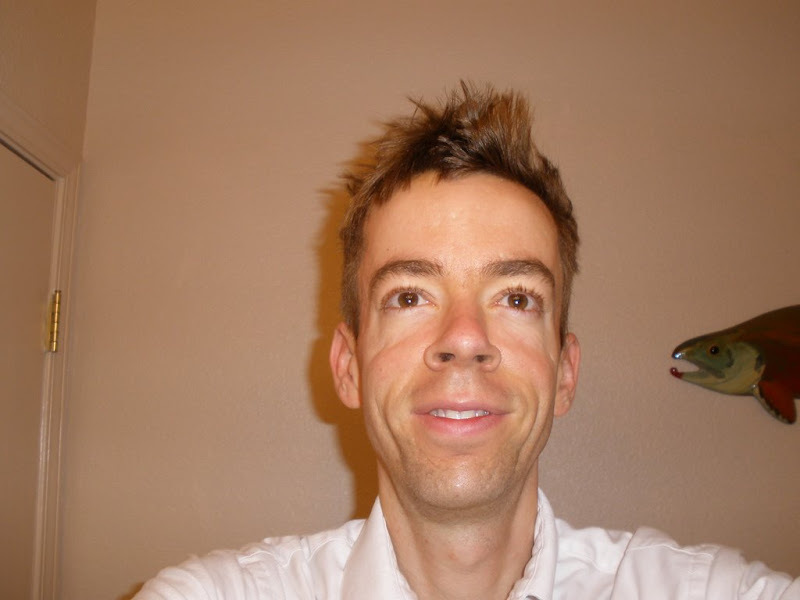 Here's how I looked Saturday morning after going to bed with a wet head. To some people, maybe this makes me look "cool"? I'm leaving this morning for Albuquerque, where I will be helping promote the Voice of the Martyrs' children's curriculum at the annual New Mexico Christian homeschooling convention. The convention is being held at a large Calvary Chapel in Albuquerque. God willing, I will be back on Saturday evening. These three days will be very full of events with importance. In addition to the homeschool convention there are 3 or 4 other goals that I'm hoping to accomplish through this one trip. If you are a follower of Jesus, I would be grateful for your prayers for myself and the rest of the VOM team who will be there. We all will bring our particular weaknesses to the convention. One rep is 92. One is greatly weakened by the after effects of a heart attack. One is scheduled for intestinal surgery next month. One rep's wife will be having cancer surgery on Monday. And yet we are coming together for this event, praying that God will show His strength through our weaknesses, just as He does through the persecuted church. I look forward to sharing with you what happens! My grandfather died one year ago today. He would have been 93 if he were here today. Going through some old cassettes recently, we discovered a gem from approximately 1992, when my grandfather read Romans 6 to 8 aloud and commented on it, then made some personal remarks at the end. It is encouraging to hear him testify so boldly and clearly about his faith in Jesus. I'm so grateful to have had a grandfather who embraced Jesus and I look forward to seeing both of them some day! If you cannot see the embedded player above, click here to listen. Thank you to all who have been praying for my mother. Late last week we thought we had figured out a natural treatment using adjustments to diet as well as various herbs. On Sunday it seemed to be working very well; she was able to eliminate basically normally. But since then, all of that seems to have stopped working again. The only thing that provides some relief is colonics. At present she plans to have colonics three times a week until there is further change. From the reading she's done on the internet, apparently there are a surprising number of people in basically the same situation. I can see that intestinal functionality is something I have really taken for granted. Thank You, God, for all the parts of our bodies that DO still work! And thank You for friends who are praying for Mom. Have some snippets of time you feel you should use more wisely? Here are seven high-impact things just about anyone can do. Volunteer for a great Christian organization like The Voice of the Martyrs or The Gideons. Read good books. Here's a list of my favorites. Write letters to prisoners. Click here to learn how. Have more ideas for ways to use time wisely? Please leave a comment! This will probably shock some of you, and you may think he's too extreme, but I've listened to enough of Paul Washer to know that he is saying this out of genuine love and sorrow, not out of pride or unholy anger. I also know that he's speaking the truth. If you don't see the embedded video, you can watch it here. Thanks for all your prayers. And thanks to Chris for keeping this updated while we couldn't. Mom is having another colonic this morning.